"Five More Students, Westbrook College, Class of 1976"
Five Westbrook College students Pamela Shay, Mary Gormley, Jane G. Mermelstein, Margaret Josephine Norton, Lis Anderson, Class of 1976, were Nursing majors and Day Hops. 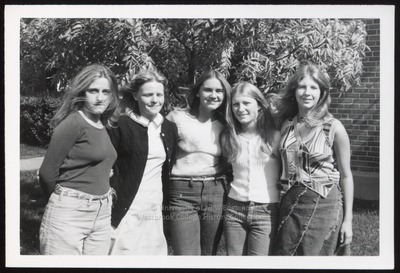 For their senior class candid photo, which appeared in the 1976 Tower Yearbook, four of the girls wore jeans with sweaters. One wore her student nurse's uniform and a cardigan sweater. All five have wavy, long hair, which hangs over their shoulders and is parted in the middle. They pose, arms linked around each other's backs, on a corner of the Campus Green.